A great number of scientific studies about The Puna are gathered in this book to offer an outlook about this fascinating ecoregion. Altitude where time seems to stop among valleys and flatness […]. Intense sunlight, freezing wind; plants, animals and bacteria that have developed unique forms of living to survive. Native and Creole communities, mining companies, tourists, mountaineers […]. One of the earliest human settlements in South America. […] Naked soil and erosion that undresses million-year-old fossils and minerals of great value: gold, silver, copper; the largest lithium reserves of the world. 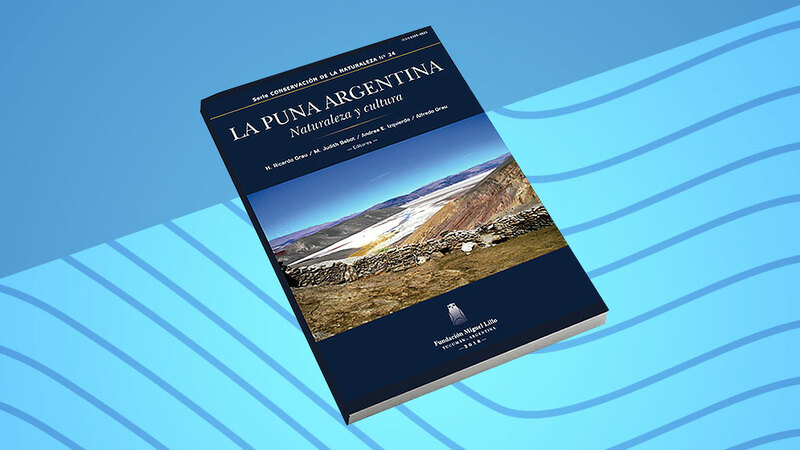 Volcanoes (the highest of the world), huge natural salt flats, blue lagoons, choiques, vicuñas, foxes, pumas, shepherds, very hot or frozen waters, snow”, this is how the Puna is portrayed in the prologue of the book published by Miguel Lillo Foundation. “La Puna argentina: naturaleza y cultura” is the title of this piece of work that collects everything that is known, and ignored, about “one of the first developed regions of the current Argentina; one of today’s most marginal”. The studies of more than 80 authors, many of which are CONICET’s researchers, are depicted in the book edited by doctors Ricardo Grau, Andrea E. Izquierdo and Alfredo Grau from the Institute of Regional Ecology (IER – CONICET – UNT) and by doctor Judith Babot (Miguel Lillo Foundation – CONICET). IER’s director and coauthor, PhD Ricardo Grau, tells us about his experience during the creative process of the book. – When was this book born? The idea of this book was born three years ago. At that time, our institute had recently started working in the Puna and we realized that many people were producing information about it, but in a localized and disperse way. There was not a regional perspective or interdisciplinary: one research group in Jujuy, another in Catamarca… So, we decided to gather together all the information, and to learn a lot during the process. – The Social Sciences together with the Exact and Natural Sciences are reunited in this book, ¿how was this integration possible? I think that is one of the strengths of the book: it puts together all the disciplines that contribute to the knowledge of the Puna’s landscape. When you go to the Puna, you see volcanoes, salt flats, shepherds, mining companies, the railway. Behind all this, there are social activities, there’s history and culture. That is why the book is called “The Argentine Puna: nature and culture”. We tried to identify most of the researchers that work in the Puna in order to cover the different disciplines. In Archaeology, we distinguish three main ages: the pre-agriculture period; the period from the beginning of agriculture to the more developed Incan agriculture and, finally, from the Incas till today. In the section about “uses of the land”, we have a chapter dedicated to livestock raising due to its importance; another dedicated to camelids which is the distinguishing fauna of the region. Finally, there is a chapter about human demographic processes. – The book is organized into four sections: a) Physical environment, b) Biodiversity, c) Social systems over time, and d) Present and future uses of the territory. What is the contribution of each part? The first section deals with Geology because the geological characteristics of the Puna are outstanding: with its volcanoes and all that naked rock, its landscape is very unique. We have also included a chapter on climate and climate change which is a very important variable defining the ecological functioning. Obviously, we cannot forget about the wetlands, environments that are central to human and natural life. The second section, Biodiversity, presents a typical classification of plants, animals (mammals, amphibians, reptiles, birds) and a very specific chapter about the bacterial biodiversity which is extremely attractive because there are various types of extreme life. Paleodiversity also has its place. There is one section dedicated to human beings with archeological chapters. Others about History, which include a human demography chronicle of the last decade. “Uses of the territory” is the most interdisciplinary section: we discuss about mining, ranching, tourism, among other topics. To conclude, we present a comprehensive final chapter that tries to capture every process of teleconnection. It analyzes how the Puna relates with the outside world (external markets, cultural exchanges, immigrants that send remittances back to their home countries). – What are the boxes? Boxes are briefs that deal with issues that are minor but still important or interesting. For example, agriculture is a minor activity in the Puna, but it is discussed in a box. There is another one about geothermal energy because it has a huge potential. Other issues are just very attractive like a study about Lullaillaco’s mommies. In my case, I wrote a box about the Andean donkey because when you go there, you see many of them, although it does not belong to the native fauna. So, ¿what is the story behind this cute animal? – Can we say that this book is more than a compilation of papers? Each and every chapter is original, a completely new review. Each went through a peer review process. The editorial viewpoint focused on language to make it simple, trying to avoid very technical terms so that every reader can enjoy it. We hope the book be read by a lot of people. It was a great effort because we, the scientists, are used to writing for our colleagues mostly. – Which are the main socio-environmental problems in this region? How are they treated in the book? The Puna used to be a central and populated region when the Spanish settlers arrived. Five hundred years ago, the more South you went, the less agricultural development you found. Today, the situation has chanced completely: it has become a marginal region from a socio-economic viewpoint. For this reason, Puna’s population is very exposed to external forces: tourism, mining companies, the federal state, among others. State government’s role is essential because it guarantees the public employment, the education system, and the construction of roads. The climate is another very important issue of the physical environment. In general, high mountain regions experience climate change with more intensity than lowlands. The Puna has been becoming drier in relation to the last 400 years. All these changes have their impact on ecology. For instance, a dramatic aspect is shepherding because herbivores have great influence. A thousand years ago, there were vicuñas that were replaced, over the past 400 years, by sheep, cows, goats and donkeys. Today, the vicuñas have returned specially in very remote places. – In the book, some suggestions are made about management and conservation plans, like promoting applied sciences on the region, ¿have you thought about different ways to make these strategies real? We would like to influence on the mining industry which is exploited to obtain lithium. This activity is growing globally because of the huge demand for this mineral for tablets, telephones, computers, hybrid cars, and so on. All this may help developing the region, but may also have a negative impact over the Puna. As a result, we would like to propose guidelines so that the mining industry issue becomes an opportunity towards conservation, not a way to destroy its resources. – ¿Which is, in your opinion, the highlight of the book? I think it is an integrating work that has gathered many people of different disciplines. That is its highlight: to have a hundred people who have something interesting to say about the Puna from different perspectives. The book has 23 chapters and around 30 boxes, that is, more than 50 outputs. Almost a hundred authors in total. All their voices are brought together in 500 pages. – ¿What would you like to be the reader’s impression of it? First of all, I would like to transmit that the Puna is a wonderful place. I think that all the authors are, in a way, in love with the Puna in an esthetic sort of way. It is a moving place with great strength. The second message would be that in order to protect the Puna ecosystem we have to get to know it deeply, specially we need to understand the complex interactions between the biophysical environment and human factors. We shouldn’t assume extreme positions, but rather work all together with an integrative viewpoint in order to preserve this fascinating ecoregion. This publication is part of the series “Nature Conservation” of Miguel Lillo Foundation (in Spanish: Fundación Miguel Lillo). It comprises scientific works related to the preservation of the native flora and fauna. It is written only in Spanish, but the authors will be pleased to answer doubts o receive comments. Bibliographic reference: H. Ricardo Grau, M. Judith Babot, Andrea E. Izquierdo, Alfredo Grau (editors). 2018. La Puna argentina: naturaleza y cultura. Serie Conservación de la Naturaleza 24, Fundación Miguel Lillo.